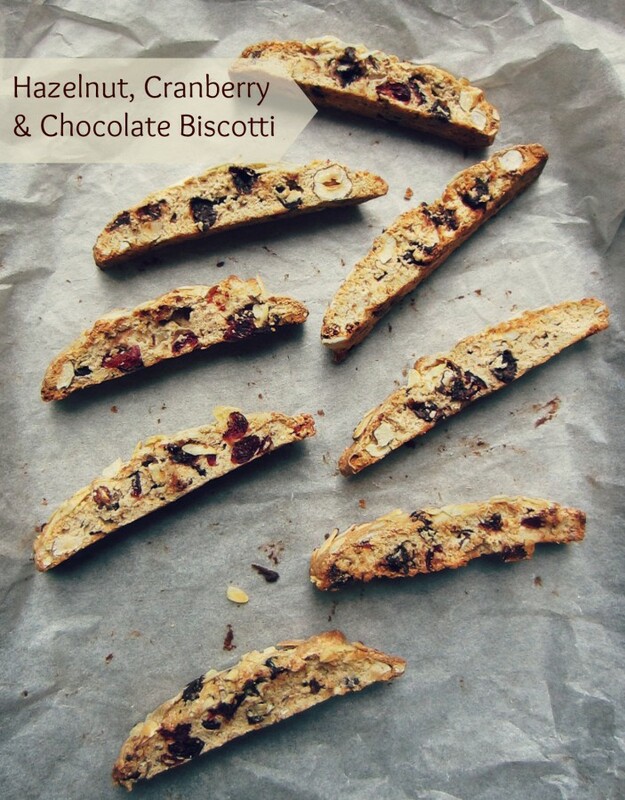 Ah biscotti…just like panini and grissini, these are plural names for the snacks. I don’t know a huge amount of Italian (I only scraped through the GSCE), but I always find it funny when people order a panini, only really wanting one, but technically asking for multiples of the posh cheese toasty, it’s a panino don’t you know! So I made biscotti, but if I were to offer you one, it’d be a biscotto, still with me? Good. To confuse things further these are also sometimes called Cantuccini (coffee bread). The traditional name biscotti however comes from the cooking method used, these are twice-baked, once as a loaf and then sliced and baked for 10 minutes to become even more crunchy. I had big plans for these biscotti, I was going to reserve some and add them to a Rocky Road recipe, along with some of my homemade strawberry marshmallow. 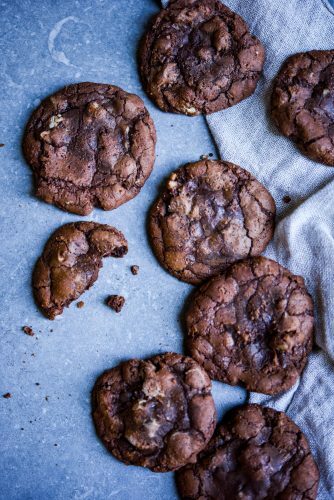 The recipe I originally had was for Almond and Cinnamon Biscotti, but I just didn’t think that would stand up to the strong flavours of the dark chocolate and sugary marshmallow, I’d be using in the Rocky Road. 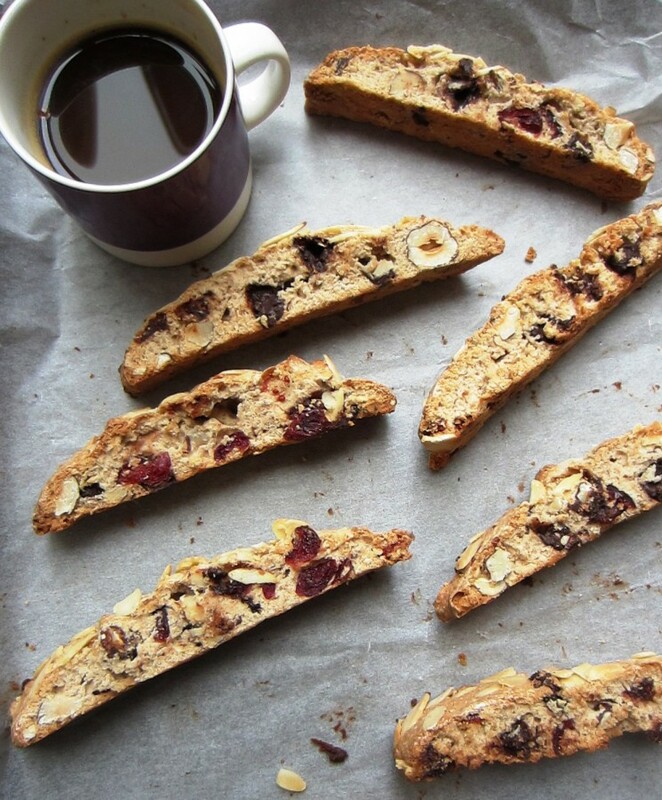 I also didn’t want a rock-hard biscotti, so I added some dried cranberries to give these a bit of chewiness. The final flavour I settled on (as the title would suggest) was hazelnut, cranberry and chocolate biscotti, with some mixed spice and sliced almonds sprinkled on the top. The resulting dough is very thick and I used a disposable piping bag to pipe out my two loaves of biscotti, just cut it to an opening of about 5cms. I’ve included a picture of the biscotti after their first bake, so you can see that they really aren’t going to win any prizes for their looks, they’re baked at a low heat so that they don’t get too much colour. Now these need to be cut as soon as they come out of the oven, so you can pop them straight back in the oven once you’ve sliced them. Initially I used a bread knife to cut these, that was a bad move, the biscotti began to fall apart as the serrated knife started to tear them. So I changed to a normal straight bladed knife and this cut through them perfectly. The sliced biscotti are then laid back on the baking tray and baked for a further 10 minutes to crisp them up more. This is what also gives them their name. 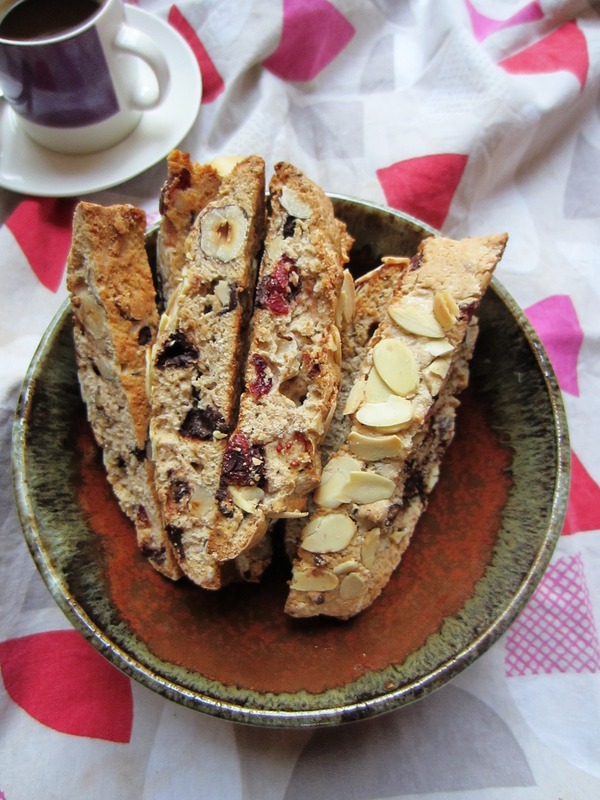 A delicious biscotti recipe that goes perfectly with a steaming cup of black coffee, or even hot chocolate if you're feeling particularly indulgent. Preheat the oven to 180C. Butter a baking sheet and dust it with flour, shaking off the excess. Add the mixed spice and fold in with a spatula or wooden spoon. 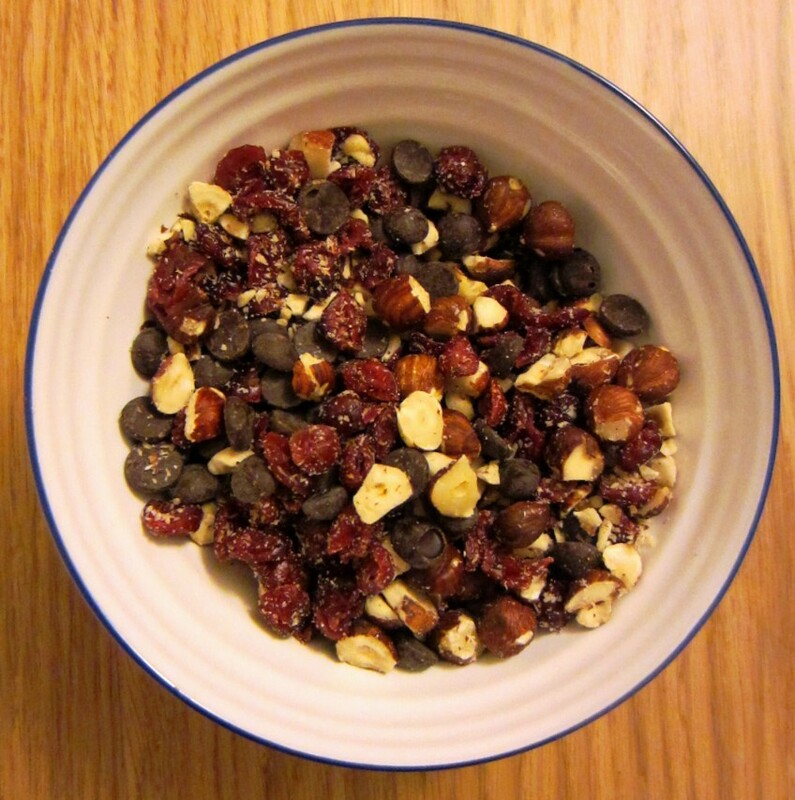 In a food processor roughly chop the hazelnuts and add them to the batter with the chocolate chips and the cranberries. Add the sifted flour and fold this into the mixture, the mix will be very thick. 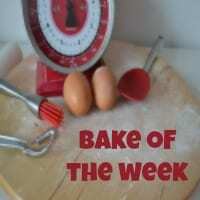 Spoon the batter into a pastry bag, without a piping nozzle and cut an opening of about 5cm. Pipe into two rows 25cm long by 5cm wide on the prepared baking tray. Or pat the dough into two sausages on the baking tray. 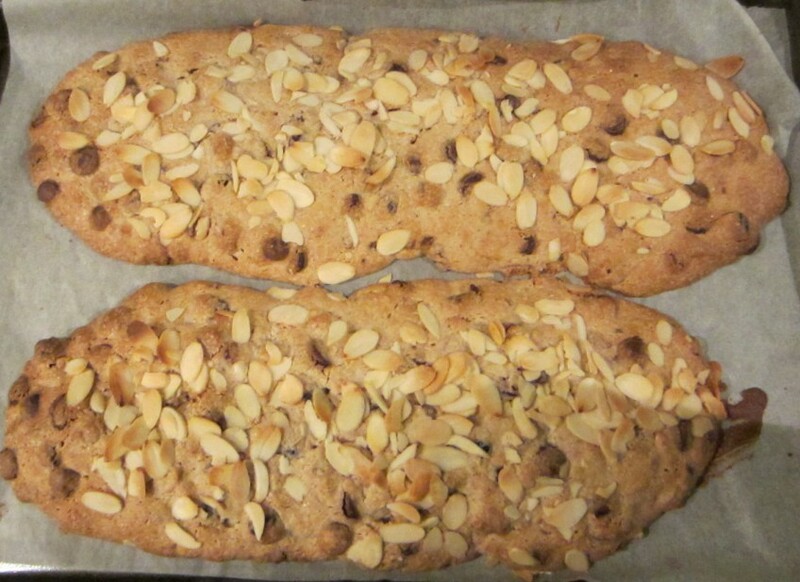 Sprinkle the loaves with the sliced almonds and bake for around 30 minutes until a cocktail stick comes out clean. Leave the oven on. Immediately transfer the loaves to a cutting board, and slice them on the diagonal about 1cm thick. Place the slices cut side down on the same baking sheet and bake for 7-10mins until crisp, but still pale. 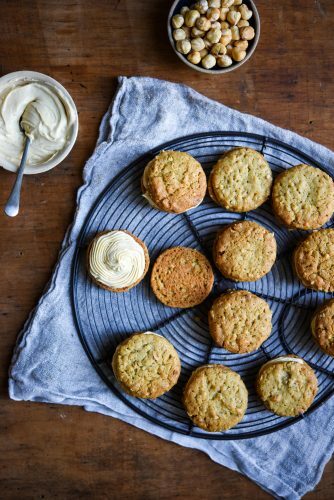 The recipe for the biscotti and the other recipes included on Patisserie Makes Perfect can be found in the recipes section of the site, which has now been divided into sub-sections. Biscotti, do you like them? Have you made them before? What are your favourite flavour combinations? Thanks for reading and don’t forget to enter my giveaway which is closing on 30th September. This is another one that reminds me of my father. 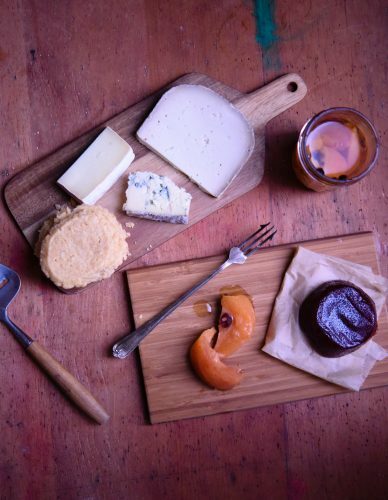 He loved to have biscotti to dunk in his coffee. Nothing about them appeals to me at all but I wish they did. 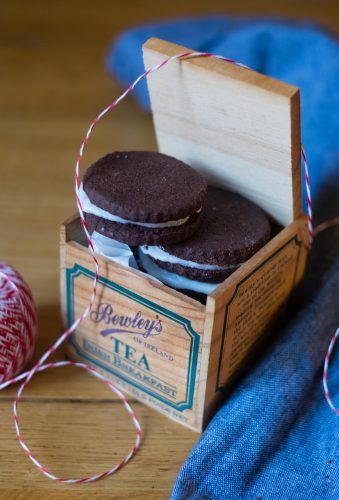 It just seems so quaint to have a hot cup of tea and a biscotto ( <– see that!) on a lazy Sunday morning. When biscotti look that good I don’t think you can only have one biscotto, I’d love one of these to dunk in an Americano. “Latte” is the Italian word for “milk” – so if you want a British latte, you’re better off ordering “caffelatte”. Although that’s mostly something people have for breakfast at their home, we’re much more likely to stick to espresso and cappuccino when we go out. And I agree, who needs a biscotto when you can have two, or three (or five) of them? Ah thank you for the explanation 🙂 I really like espresso, cappuccino, I don’t like so much. Here, here to many biscotti also. I’ve never made them before this, but after seeing people rave about them, I knew the dry thing you get in some cafes couldn’t possibly be a true representation. These are really easy and really tasty. Give them a go Emma, you can change the nuts/fruit to be anything you want.